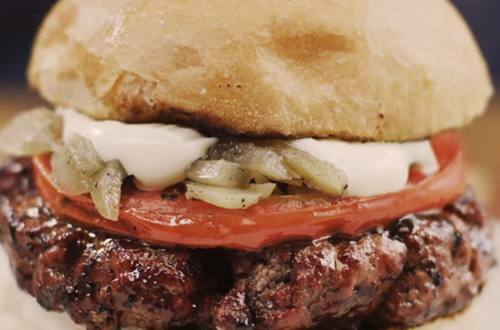 The Bon Burger takes burgers to another level: Level French. Good meat, good bread, good grilling. Bon! 2 Take your mince, season, divide into the relevant number of servings and shape into burger patties. 3 Rest patties in the fridge on a tray. 4 Place a couple of onions directly on the coals in your BBQ for 2 hours, turning a couple of times. 5 Remove the onions, and rest for 10 minutes. 6 Remove all the burnt skin and using a sharp knife roughly slice the cooked onion. 7 Grill the burgers with salt and pepper and at the end glaze with Hellmann’s American BBQ sauce being careful not to burn the glaze. 8 Serve in a fresh burger bun, with the dirty onions, a slice of tomato or any salad of your choice and top it with a dollop of mayo.